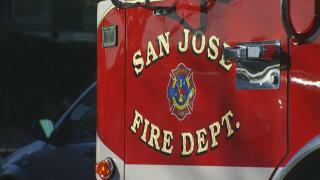 Three people were hospitalized late Wednesday following a two-alarm fire at a San Jose apartment, firefighters said. Witnesses said an elderly woman had to jump from a second story window during the blaze. The apartment complex is located at 2925 Florence Ave. Firefighters said the two people injured are older residents who were inside the apartment when the fire began. A third person in the area was transported to a hospital with smoke inhalation. Witnesses said the two people were rescued from the apartment by a neighbor. A firefighter also suffered a minor injury and was treated at the scene.